On this day in 1941, Robert Allen Zimmerman – or, as he is famously known, Bob Dylan – was born in Duluth, Minnesota. From an early age, he had a strong interest in rock and folk music, which led to his career as a singer and songwriter and ascension to the status of music icon. Dylan signed his first recording contract in 1961, and soon after became prominent in the civil rights movement. Songs like “Blowin’ in the Wind,” and “The Times, They Are a-Changin'” became powerful anthems of the social struggles and anti-war sentiment of that era. Notably, he sang at the March on Washington for Jobs and Freedom in 1968. He was influenced by figures such as Elvis Presley, Jerry Lee Lewis, and Little Richard, and was friends with Woody Guthrie, whom he paid visits to in the hospital after Guthrie was diagnosed with a disease of the nervous system. 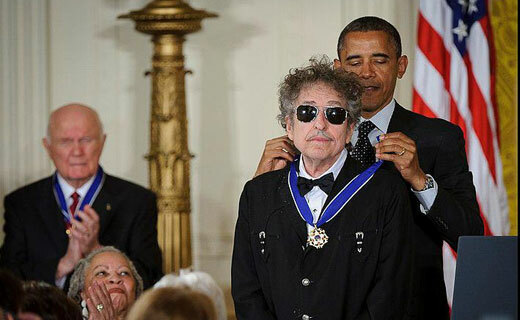 In May 2012, President Obama presented Dylan with the Presidential Medal of Freedom, which recognizes citizens who have made significant contributions to national interests, world peace, or cultural endeavors. With his music featured in such films as 2009’s Watchmen, Dylan and his songs continue to remain popular, even among newer generations of music fans.